We have gotten our first sponsored chapter in the queue! Thank you :). If possible please add this to your Novel Updates Reading List do leave a review as well. Zou Liang swallowed all of the words he was going to say as he saw the portrait, terrified. It was him!!! But it was not Ya Se; it was the appearance he had on Earth. Zou Liang bowed and left in a good mood. As far as he understood, the Beast Spirit World reflected one’s Spiritual circumstances, and since a part of his spirit was Ya Se while another was Zou Liang, his appearance looked very similar to the one he had in his previous world. It left him a touch glad and slightly emotional. But since he was young and this world was so marvelous, the flicker of homesickness was quickly tossed away. In the large hall, Ai Wei Er had already arrived equipped in red martial attire, like a beauty ablaze in fire. At her side stood three tall warriors. Ou Nisi Te was always silent when he met strangers, but the four youths were not shy at all and talked as if they were at home in the temple1. When Zou Liang appeared, the three young warriors all revealed a worried expression. This wasn’t because Ya Se was handsome or anything, but simply that no youth could resist the attraction of Dual Engraving. Ai We Er’s counterparts knew that the Dual Engraving Method had originated from this young Engraving Priest and that his success rate with it was even greater than the Head Priest’s. Zou Liang could feel the three’s valiant Beast Spirit from far away. Everyone’s Beast Spirit was different, but an expert’s would always give off a rich feeling. “Yi Ka Bo De – Lan Di, a Shadow Hunter, a leopard warrior everyone can rely on!” Lan Di introduced next. “Rely on how quick you flee, you mean,” Ke Te interjected from the side. “Little kitty, go sit over there,” Lan Di impolitely argued back. These two had been rivals ever since they were young, and whenever they met if it wasn’t a verbal fight then it was a physical one. Needless to say, however, these two were the leading people of the younger generation. “I have also just finished my plain grade gear. I was originally very pleased with complete attribute plain grade gear, but I could only cry after your Engraving Method was publicised,” Lan Di mocked himself. “This one is called Patelisi (Pàtèlǐsī) of the Yi Ge eagle tribe. Sniper-type Archer.” Ai Wei Er spoke, introducing the quieter youth. The ability of anyone who came with Ai Wei Er would not be ordinary. “A Berserker warrior2, you brothers are current the most famous people of our Ye Lu Samo City,” Lan Di smiled. “The speed of your leopard clan is certainly fast, Lan Di!” Ke Te sincerely remarked. “Of course! Our speed is number one under the Heavens!” Lan Di arrogantly replied, tilting his head in a conceited manner. Ai Wei Er helplessly covered her forehead. She regretted bringing the two of them but couldn’t help but admire how they would argue regardless of place or occasion. “Ya Se, have you finished preparing? How is it?” A gentle yet beautiful voice rang out, forcing the two noisy people to stop in stunned fixation at the person at the entrance. Our beautiful priestess Ao Li Quan Ya wore a white attire, her hair arranged as fluidly as silk. A pair of spirited large eyes paired with her charming face was enough to leave others addicted, but it was especially her mouth beaming with happiness showing a self-satisfied expression that furthered the impression of a high-class girl. Ao Li Quan Ya’s fine style of dress was very simple but it suited her white style very much. Only this white priest gown could suit the temperament that was etched into her bones. 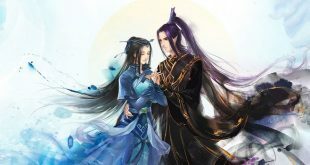 Lan Di and Ke Te were not strangers to the outer world, and were in fact quite experienced. These two big shots would often flaunt their talents, but they were instead subdued when they met Ao Li Quan Ya. To speak of countenance, both Ai Wei Er and Ao Li Quan Ya would be counted as rare beauties, and though their styles were different they both had their particular merits. But Ao Li Quan Ya had an unexplainably clear feeling about her, a pure type of feeling that gave others an unblemished and innocent impression. Ke Te and Lan Di were both shaken out of their trances, feeling regret for their previous lack of composure; they had been far too shameful. Ai Wei Er clapped her hands. Not only males, but even females would be shaken by this kind of beauty; this was the kind of noble appearance that felt distant to onlookers. The Bi Er tribe’s straightforward nature gave people a good impression, especially for Ya Se who had made the Dual Engraving Technique and was already spoken of by others as a legend with a majestic status. A trial by fire, however, was a combat profession’s job, and Ya Se’s honest nature made the warriors very comfortable. “Priest Ya Se is too modest. Having such talent in Spirit Engraving, your achievements in war songs would not be too ordinary, either,” Lan Di smiled. “Bootlicker,” Ke Te to one side popped his bubble once more. “You two should calm down for a while. Since we’re currently a team, we’ll need a team leader,” Ai Wei Er laughed. “A leader… Ya Se, I want to be the leader,” Ao Li Quan Ya suggested since she had never been a leader before, herself. “You can’t; you always space out.” Zou Liang didn’t want them to all go and throw their lives away. Ao Li Quan Ya’s mouth settled into a pout; though their previous promise meant she had to endure right now, since he had dared to belittle her she’d pay him back slowly in the future. Zou Liang did not think this little damsel kept grudges so intensely and just concentrated on what needed to be concentrated on. “Moon-faced cat, move aside! When this ancestor of yours3 is around, the leader position will not be yours to take,” Lan Di snorted. “I won’t be leader,” the silent Patelisi who was sitting aside remarked.